At All Terrain Services, we simplify construction, mining and agricultural projects. 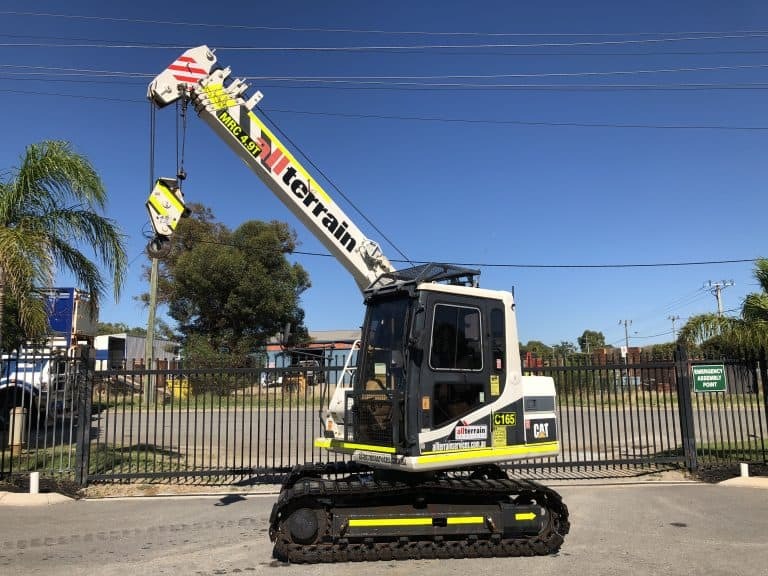 Based in Perth, our professionals supply a number of high quality spider cranes and mini crawler cranes for hire across WA. From simple, short term hires to ongoing hires for major projects, we pair you with the right crane for your project. With high quality mini crawler cranes and spider cranes for hire, we offer cost effective equipment solutions for clients across industries. In addition to supplying telehandlers, forklifts, mobile cranes, mini cranes and Manitou telehandlers, we also offer expert technical services and spare parts for maintenance and troubleshooting. Learn more about our range of mini crawler cranes for hire and get started on your project today. Compact and functional, our mini crawler cranes are designed with compact bodies ideal for navigating into tight spots with difficult and restricted access. Most commonly used for underground construction, mini crawler cranes provide you with the power and agility necessary to complete a variety of projects. With near-zero tail swing, our cranes make slewing work easier than ever in confined spaces. Work safer, smarter and more efficient with our range of quality mini crawler cranes. With simple handling and impressive manoeuvrability, our mini crawler cranes help you move loads and reach limited access areas with efficiency and ease. Available for both short and long term hire, the team at All Terrain Services matches you with the perfect mini crawler crane hire solution. For the ultimate in convenience and productivity, our mini crawler cranes feature pick and carry capabilities. Our all terrain forklifts and cranes are able to manoeuvre across a range of terrain types, from smooth roads and tracks to rocky construction sites. Instead of requiring excessive machinery to transport and hold your loads, our pick and carry cranes do all the work for you. Our cranes lift loads of various sizes and transport them across your site to make work safer and more efficient. Whether you’re moving materials to their designated build site or are clearing an area of construction waste, our pick and carry mini crawler cranes help you get the job done fast. Working safe is our top priority. Our mini crawler cranes come fully equipped with a range of safety features and technology to help protect your employees and on-site personnel. Our cranes feature tipping prevention systems that display a warning and sound an alarm if a load reaches 90% of the rated total load. When reaching 100%, the crane automatically stops to prevent tipping. If your crane tilts at a dangerous angle, an alarm sounds for the operator to restore a safe working and travelling angle. Safe load indicators set a lifting height, working radius and angle limit. Ideal for narrow spaces and restricted access, the working range can be set according to your requirements and will automatically stop at the set point. All Terrain Services specialises in the supply of a wide range of mini crawler cranes, all terrain forklifts and spider cranes. Offering a variety of flexible solutions, our fleet of cranes help you increase your productivity while working safely and effectively. Find out more about our crane hire today. Contact us on (08) 9358 6788.